This circuit lets an external 12V SLA battery power a camcorder which normally has an inbuilt 7.2V battery. Such batteries can now be very difficult or expensive to obtain for earlier model camcorders. 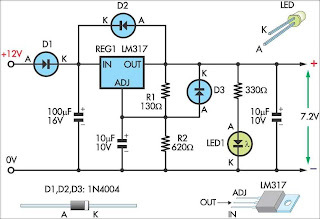 In essence, the circuit is a standard LM317 adjustable regulator with resistors R1 & R2 set to provide 7.2V (depending on the accuracy of the 1.25V internal reference). If the resulting output voltage is low, it can be increased by reducing the 130 resistor and vice versa.